Baja Mexico is a great place to visit for a quick getaway with inexpensive and short flights from the states. But picking the right spot is harder. Most will pick the big cities, but there is something to be said of smaller towns with a more intimate and unique experience to offer. I had the unique opportunity to discover a quiet little town, Los Barriles, as part of the Surge Influencer conference. 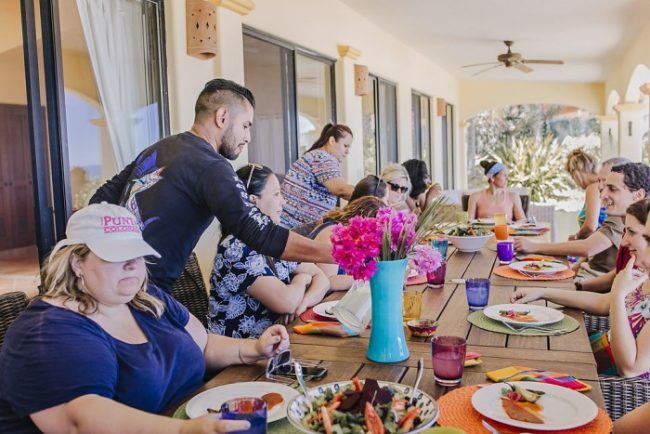 Participation in the Surge Baja Conference included complimentary accommodations, dining, and excursions. All opinions are my own. Photo Credit: All the incredible photos throughout this post were taken by Chelsea at Boudoir By Chee. So, where is Los Barriles Mexico? Los Barriles is just 45 minutes outside of Cabo San Lucas in the Baja California Sur (BCS) peninsula in the east cape. This quaint fishing town will give you all rich experiences of Mexico without the overcrowded tourist traps. Here’s our top 8 reasons to visit Los Barriles for your next trip. It’s always incredible to find a place that feels like a hidden gem that isn’t overcrowded. That’s exactly what we discovered in Los Barriles. 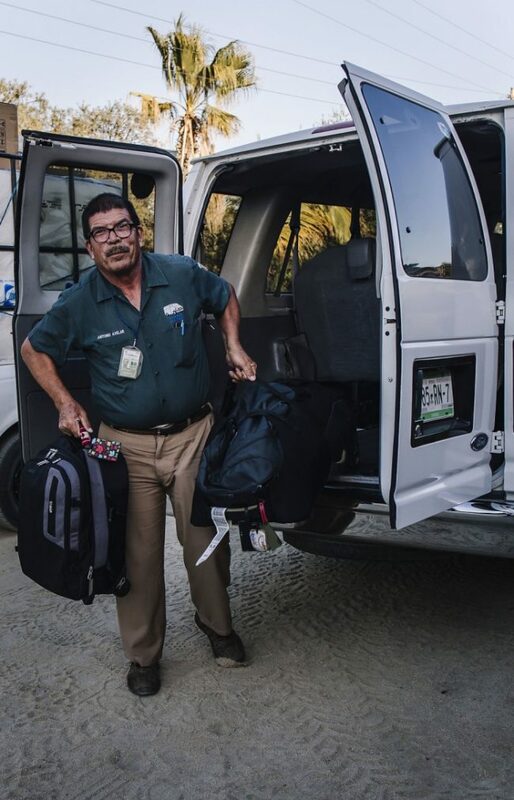 It’s just a short distance from the Cabo San Jose airport and from Cabo San Lucas, but it’s a world away difference in your experience. You’ll find dirt roads, cows and goats that cross the road right in front of you, and a people that are warm and welcoming. You can even find incredible pools, with a swim-up bar, like the one we visited at Hotel Palmas de Cortez. 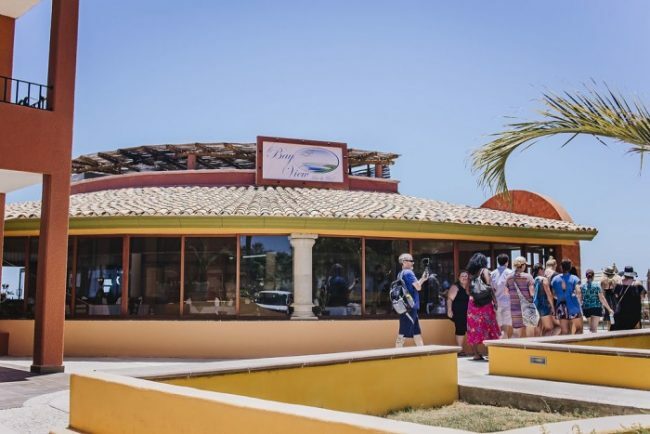 Cabo San Lucas is close enough to spend a day or two in the touristy destination and the big scene, if you want a mix of flavor, but sneak away from the busy attractions and settle into a place where the natives call home. We stayed in a beautiful, and very unique location, Hotel Los Pescadores. It’s a small 10-room resort where the owner makes you feel at home. They are also open for breakfast, lunch, or dinner, even if you’re not staying here — and the food was amazing! If you’ve never heard of pickleball it can best be described as a game somewhere between tennis and ping pong. The game is played on a small court and using whiffle balls. Because of the size of the court and the unique paddles and balls it’s a game that absolutely anyone can play. 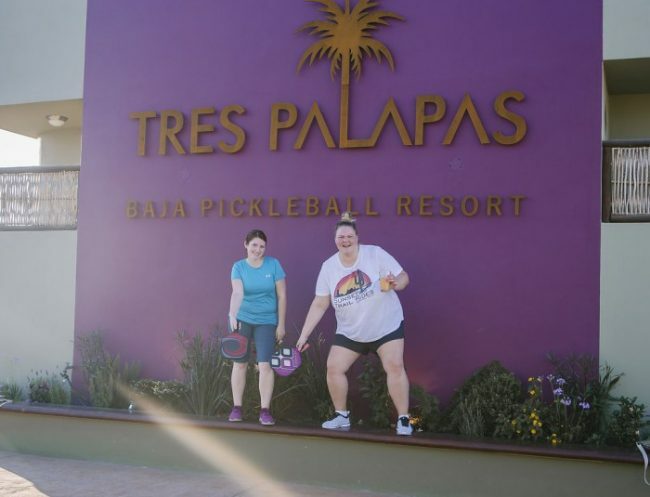 In Los Barriles BCS there is an incredible Pickleball Resort, Tres Palapas, where those that want to learn, practice, play, or come to hang out have a place. The resort opened to provide a way for locals and tourist to learn more about the fastest growing sport in the world! They’re even training local students who can use their skills to advance to tournament games providing such a positive impact on the community. 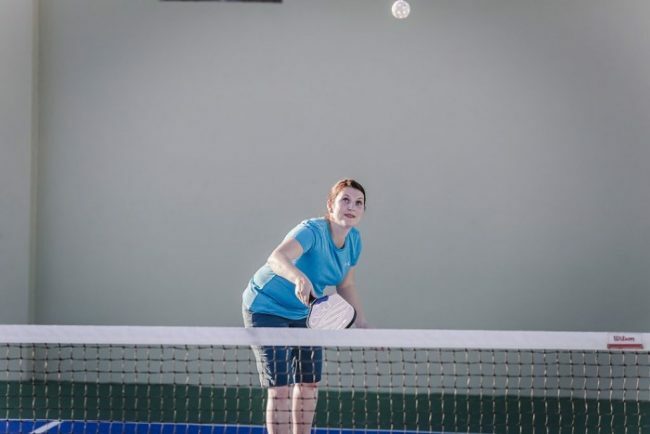 I wasn’t sure how I would feel about pickleball, as I’m not very athletic, but I found it was so fun and really something that just about anyone can do. Since there isn’t a lot of intense running across the court and back again it just led to having fun and laughing at our newbie mistakes. 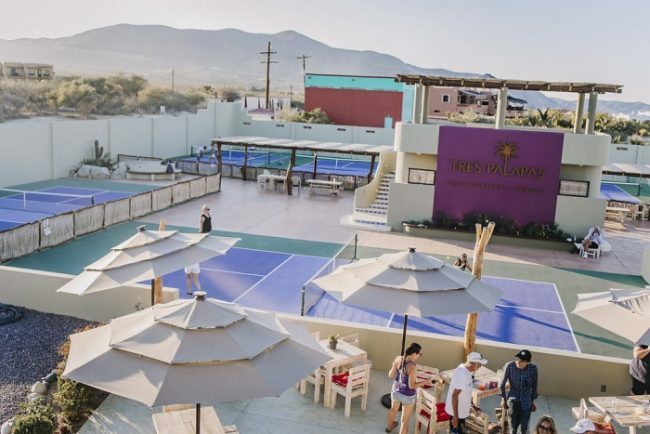 Non-players are welcomed with open arms to spend time eating or drinking at Tres Casitas, to enjoy the spa, or participate in one of the other on-site activities. It’s really just a cool place to hang out, whether you’re up for giving pickleball a try, or not. 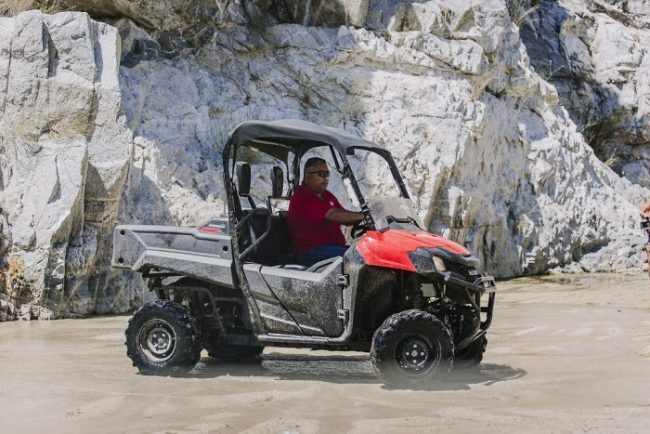 Throughout Los Barilles you’ll spot ATV’s and off-road vehicles that seat up to 6 available for rent. We took a tour with QuadGirl who a helpful guide to take us out on our journey. 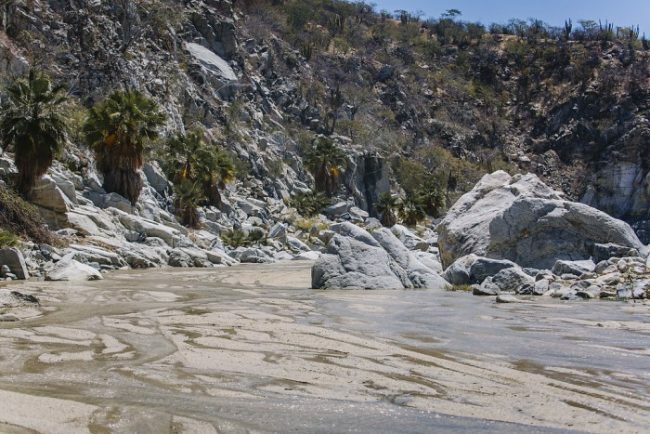 Take one for a ride out through the wide-open arroyo and race your friends as you make your way up to a hidden waterfall. We took a path up through the mountain trails, if off-roading is your scene, that led us down to the arroyo, but it’s easily accessible from the road as well. Our group had so much fun flying through the arroyo racing to be the first to reach the falls. It was such a beautiful area with the mountains rising up on each side and the flat sandy area open to explore. As we approached the falls, we parked the ATVs and welcomed the trickle of water that lured us forward to the falls. It was a nice way to cool off and play and take pictures at the falls. They create a few small pool areas and it’s a neat place to take pictures. You can extend your adventure and take your ATVs out on the beach front as well. Los Barriles is located on the east cape of the Mexico Baja peninsula with easy access to the Sea of Cortez. It is best known as a fishing destination and we were told by the locals that it’s the best fishing destination in the world. 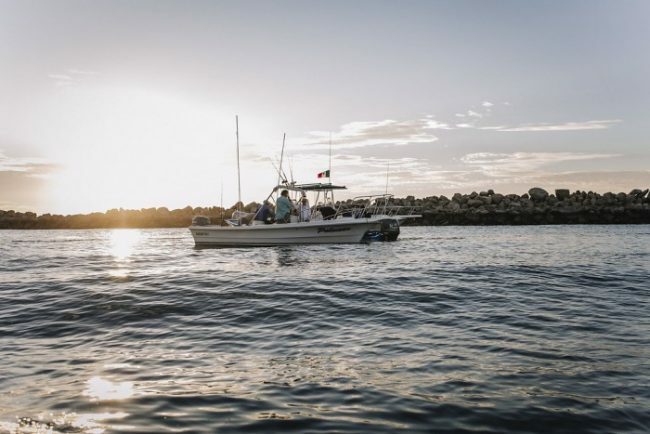 If you love fishing, or have wanted to give it a try, Los Barriles is the perfect place to visit. It was so interesting to watch the boats being launched into the sea by tractors! 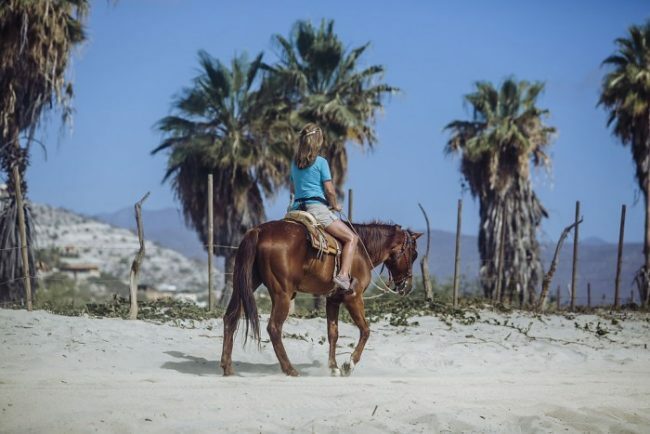 See the beauty of Los Barriles Baja California beaches in a unique way with a horseback tour. The beaches here are not overcrowded and packed with tourists. At the beaches our group visited I only spotted a few locals out and about which was so incredible! For a helpful guide, contact Horseback Rides with Betto. 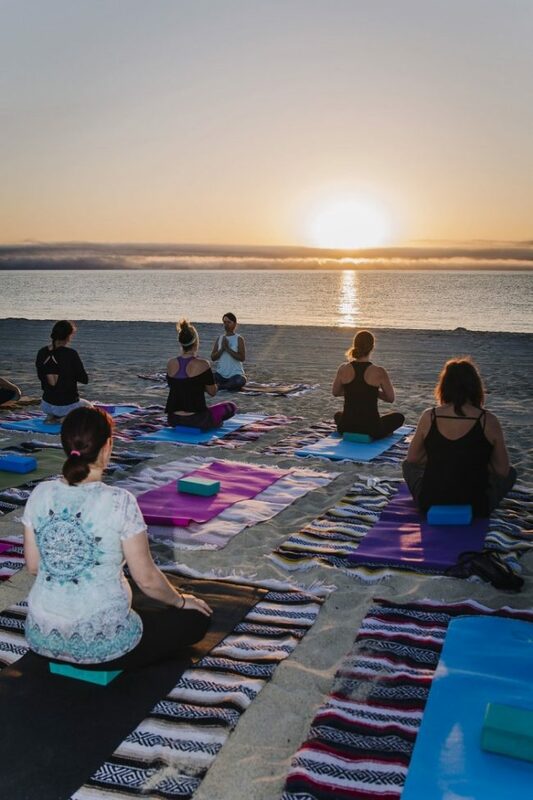 The last day of our trip we had an early morning sunrise yoga class scheduled. Our group all left our hotel a little begrudging not wanting to be awake so early, but the sacrifice was worth the experience. 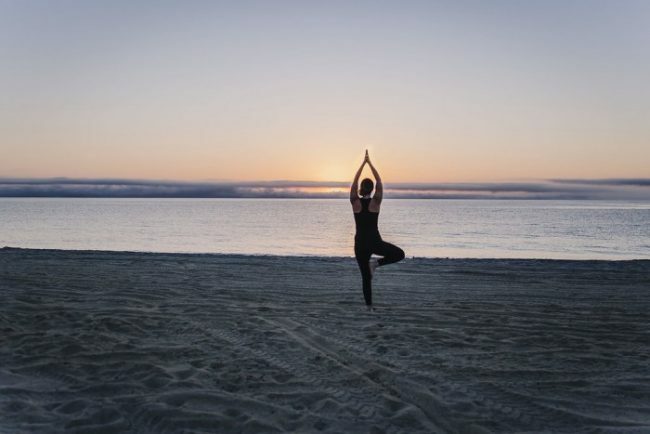 It was so inspiring to be out on the beach and in nature stretching our body to find centering. The setup was beautiful and watching the sun come up and with the perfect temperature before the heat of the day hit. Our yoga instructor guided the group to find something we wanted to focus on, pick a word, and use that word to be intentional about the different yoga positions. It was so empowering to recognize our own strength that’s inside of us. I left the class feeling grateful for the early morning sacrifice and the power we each have deep inside of us. 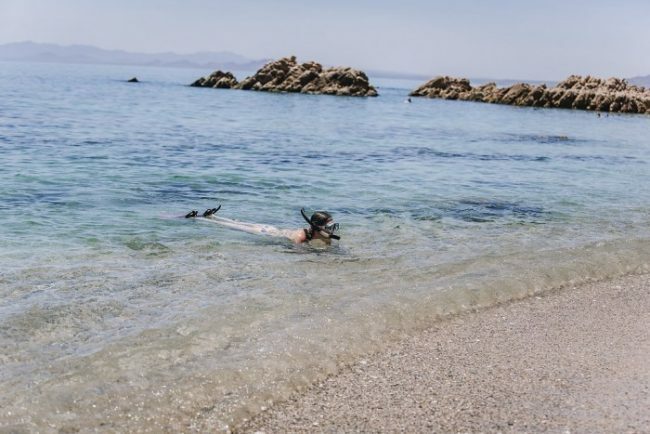 A trip to Baja Mexico wouldn’t be complete without some time spent on the beach and swimming in sea or Pacific Ocean. 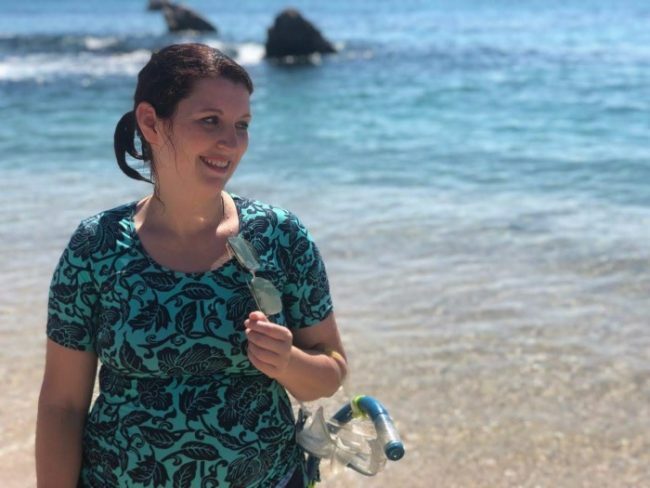 You can pack your own mask and snorkel and snorkel right off the beach front. 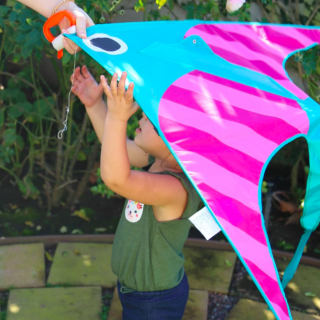 Or rent a snorkel and mask for a day. If you stay relatively close to the shoreline, you can even skip the flippers. We swam at Punta Pescadero Snorkel Beach, which has these incredible rock formations. At the beach we went to you only needed to go out about 10-15’ from the shoreline to be past the break. You’ll still be able to touch the sandy bottom so it’s perfect for entry-level snorkelers. Then, just float belly and face down as you’ll glide over a clustered area of rocks that create a home for the sea life. Patty is an incredible single woman that knows how to go after a dream. She opened and runs Hotel Los Pescadores in the heart of East Cape. The hotel is very well kept, clean, and the staff was so friendly to help assist with anything we might need. Patty is so inspiring to not be afraid to move away from the city she had known to chase a dream, open a hotel, and has been able to hire locals to create additional jobs and fuel the economy in the area. 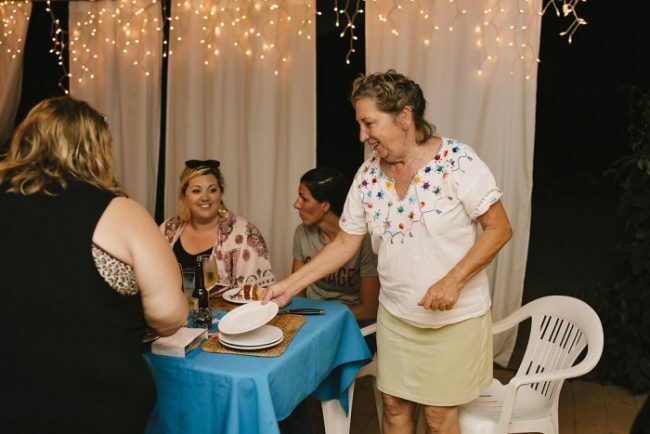 Later in the week we met Mary who started a unique home rental, Casa de Las Palmas, that caters to groups and can sleep up to 22 guests. 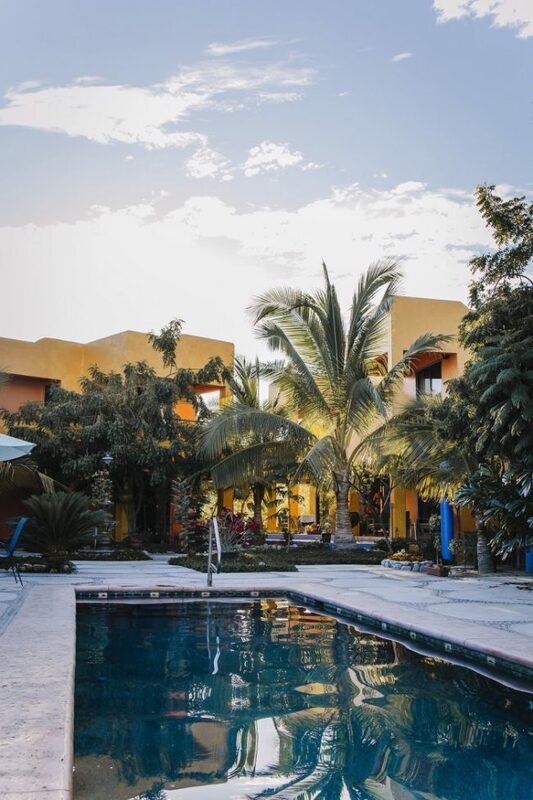 The property spans to include a main home that sleeps 6, two casitas with private baths and courtyards, and a recently added bunk house that is incredible! The property is a perfect destination for weddings, girls trips, retreats, family reunions, and has even been stay at by famous people. Mary took what was once an outdated and not well functioning property and created a place that is so unique and gorgeous with a back patio facing the ocean. 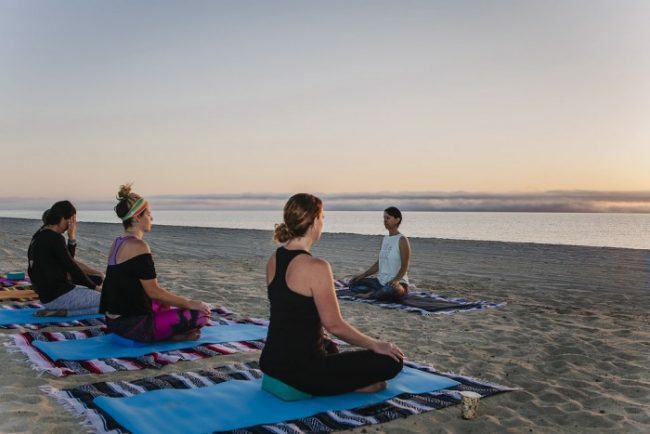 I was inspired to hear from Tehroma who led our sunrise yoga share her journey transitioning from an architecture and real estate business to opening a yoga studio, Healing Winds Holistic Center, and the growth she’s been able to create there to include acupuncture, Thai massage, and an art studio. The stories didn’t stop there, each individual we met from the Tres Palapas Pickleball Resort owners Paul and Sally, to our taxi service Victor of Los Barriles Taxi Service, to even our chef at Hotel Los Pescadores Ivan, we found men and women throughout Los Barriles who had a vision and were willing to put in hard work and their heart and souls into their passion to create something that was truly magical. 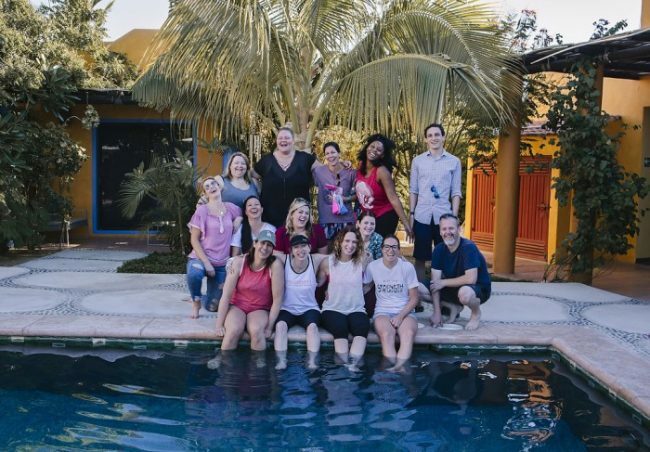 The short 4-day, 3-night trip for the Surge Conference was filled with so much learning, growth, breaking down walls, collaborating, and connecting. I left with a long to-do list to help grow my personal brand and inspiration to chase my dreams. My big take away was recognizing that we are all enough and amazing in our own unique ways. Other people’s strengths don’t diminish our own power and capabilities. If we will just have the courage to face our fears and ignore those who try to say we can’t and push forward through all the struggle we can do just about anything. I also felt the caution to not chase other’s dreams, but to find our own personal driving force and passion that can give the fuel needed to make it over the hurdles that help us each become who we are meant to be. One other valuable, but more personal, takeaway from the event is the power of telling and sharing our own stories. When we are vulnerable and authentic, we learn to find connections with others and how truly the same we all really are. It was such a pleasure to connect with the other influencers in attendance that walk in every phase of this intense and sometimes isolating career. We each came from different spheres with specialties on a particular social media platform or in traditional media and yet despite all of our differences and unique strengths, we could relate with the challenges and uncertainty we each face throughout our personal journeys. We also had two incredible media specialists running the show, and also providing helpful sessions in a laid back Q&A format that let us get the answers we individually needed. Julie of 3c Consulting runs marketing campaigns for brands and also offers resources and influencer brand development support to help you move your brand to the next level. Kelly, owner of Venone PR, had an incredible wealth of knowledge of Los Barriles, a place she’s visited for years. She helped us really feel the love for a place that was so near and dear to her heart. 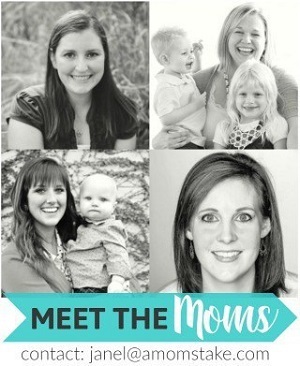 Connect with her to find PR opportunities, media trips, and more. My advice: Make the effort to reach out, be vulnerable, and make connections. Others can give you that outside perspective and help guide you to your path and towards taking your next step forward. 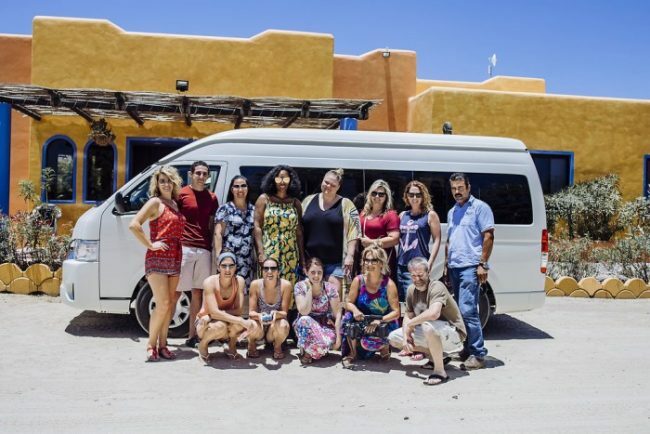 I also want to express a big thank you to all the incredible people I met, locations that hosted us, and excursions that went out of their way to welcome us to the beautiful town of Los Barriles. Surge Conference took care of everything, including bringing along an incredible photographer, Boudoir by Chee, to let us just relax, and experience the trip. It sure does look pretty there! My kids would love the ATV riding, they are super into dirt bikes and quads. Mexico is on our bucket list but we’ve never considered Los Barriles. 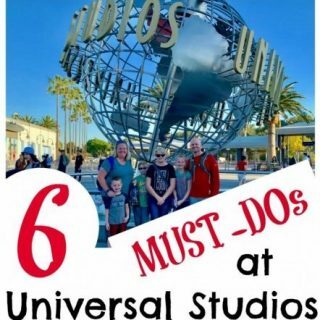 This is a great list of things to do! 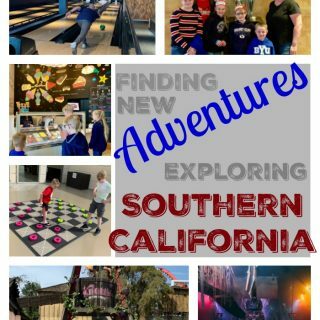 So many great things to do! 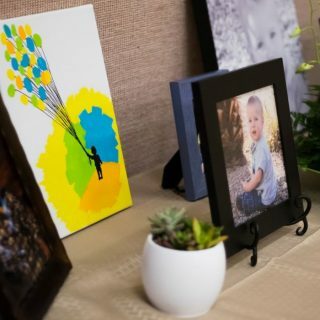 Loved looking at the beautiful pictures! I hope to head to Mexico soon. I had the best time there on my honeymoon. What a great, UNIQUE trip! I’ve never heard of Los Barriles, but would love to visit. We are thinking of traveling to Los Cabos this year! That looks like so much fun! I’ve never been to Mexico before. It’s on my list of places to go though. I hope someday I’ll be able to go. What an amazing experience. It’s nice that you took time to get to know the people you engaged with and learn the stories behind their work. Hoping you got lots of things to put you on your track upon return. Wow, that pool is like WOAH!! Holy beautiful!! I would love to visit Mexico and stay in a resort. I love Baja. It’s such a gorgeous place. I’ve only been there once, but I’d love to go back. Your trip sounded so cool! I’d definitely want to explore and see some of the hidden gems. I’d give pickleball a try too! It sounds fun!